I have a RS3 that does 510hp and 650Nm (limited due to gearbox/clutches) with a 100cell dp, original exhaust, opened induction and a special turbocharger that lies somewhere in between the TTE500 and 625. The turbocharger was done by RUF as well as the Software for the engine and gearbox. I have issues after a couple of pulls with the air tempereatures. I now want to upgrade the intercooler. In my opinion the three best choice are Forge, airtec and probably the MTR Clubsport intercooler. The Wagner is using a "tube and fin" design core and is less efficient and produces to much pressure loss. Forge and airtec are both using the more efficient and expensive "bar and plate" cores and are definitely superior to the Wagner ICs. I guess MTR is also using bar and plate, but I am still waiting for their answer and Price. Has anybody done some testing with these ICs? Even though forge and airtec are stating different volumes, it Looks like they have roughly the same size and designand both are using Standard "bar and plate" cores. Therefore I assume that the performance will be similar. Most "bar and plate" cores are very similar, except you go for the really expensive aeromotive Quality cores, but then the Price would probaly be at leat double, maybe even three times higher. Is there any experience in the difference of these two ICs? Has anybody ever tried the MTR Clubsport IC? I think we have a different approach. Then you need to talk to Tom Wrigley! He not only races but enjoys playing with the RS3. He though favours Wagner, so plenty of scope for animated discussion if you do not like it! Go to the stickies section at top of this chat room and his write up and contact details are six threads down. Have "Ruf" offered you any advice on the issue you now have? What about HG Motorsport's intercooler for RS3 8V. Any opinions or comments on this one? I am with you on this one - you can buy it without the HF logo on it, and as it uses the existing crash bar it can (in most cases, will) go unnoticed as a 'competition' add-on and not spark any warranty questions. However, I do wonder with the crash bar in place if any efficiency worth talking about is lost... But, yes, it is definitely the most aesthetic. I can't tell if you're joking?! But I think there are other Options on the market, like Forge Airtec, that are reasonably good. Isn't IC one of the first things to swap out for better inlet temp on our cars if going for higher figueres than 420-430hp? What is the cost to get 510hp? It's interesting comparing different ways. How can you know which ic is the best? You have to measure flow and how much cooling area and god knows what to get it right. I have seen some threads comparing to oem and all aftermarket ic are better but of course the question is which is the best? After some discussions with people here in Germany that had mapped Cars wir Haben wagner, forge, HG and Abt ICs I will go for the Forge IC. Overall I think it is the best package for me. As soon as we have it installed and mapped I will keep you updated. So far I have roughly spent around€ 12k. RUF Turbo mod and cnc inlet opening was around 5k, cat delete and install PE HJS 100cell cat in original housing was around 1,8k, multiple mapping by RUF engineer around 2k, TÜV around 1,5k, etc. Fortunately the facelift RS3 hatch/saloon and TTRS all use the RS3 8v pre fl intercooler. TTRS crash bar differs but fl RS3 crash bar is same. Expect to see some nice intercoolers over the course of the next year or so land from over the pond. My Wagner intercooler is sweet at just over 700hp. The forge is okay, but the coating deteriorates fast. Poor quality coating. Logging showed them to be identical @ 530hp, the wagner had a faster recovery rate. The reality is at 550hp I very much doubt it'll make a difference whether you are using a forge or a wagner. So my advice for you would be to buy whatever is cheapest. It is logical that the recovery rate of the Wagner is better, because it has not surface area and they are similar in volume. Have you got any idea about the pressure loss of the Wagner IC? Most people here in Germany and friends are using wagner, so we will probably do some tests to compare with my Forge IC. Still nobody that has any experience with the Airtec? As they are an UK company I thought there must be some members that are using it. Just do keep you informed. After some more discussions I have finally ordered the Intecooler from SAR Autotechnik. The same IC aus used from MTR and at the moment this is the IC to go for. Is that SAR intercooler a tube and fin? I will be testing the HPerformance clubsport intercooler soon. No, the SAR has a HQ Schweitzer bar and tube core. I just spoke to Tobias about the IC and he told me that they will be producing their own ICs. They sold the MTR ones until now though. He is also using the Software from MTR. He said the new ICs will be ready in about 4 weeks. Maybe I should also wait, sounds promising. Are you guys talking about this intercooler when talking about Wagner IC? I've got a RS3 Sedan not sure if they fit. I am a Japanese user of PFL 8V with ACC, and with no remappinng, but have exchanged to FORGE's one, in early September . 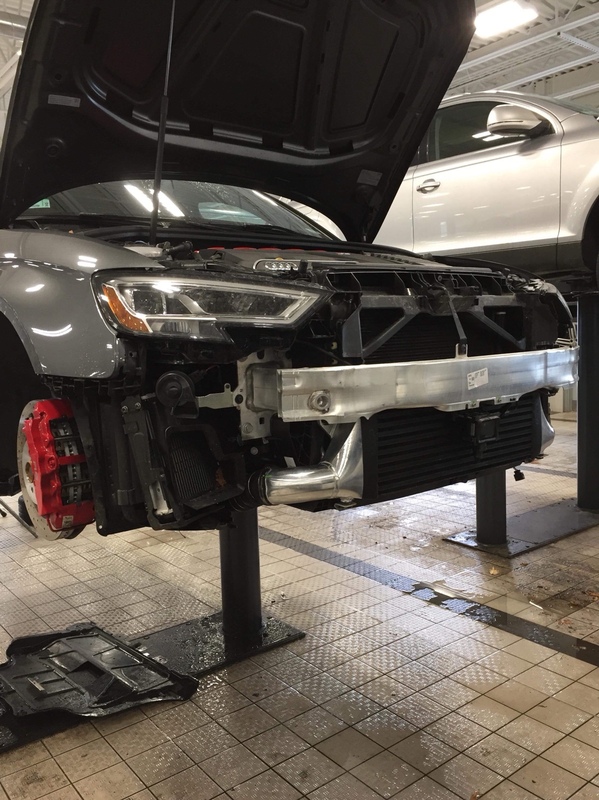 Already My RS3 had been installed FORGE high flow valve, turbo and intercooler horeses too. Certainly, I feel very good response and more power over 2000rpm. Then I think that it is necessary for intercooler, high flow valves and horses, to remapped engine. I will do the same as I am doing high mileage to my RS3 8V. Done 70.000km in more than one year. I travel a lot in hot countries and OEM IC is obviously too small for stock power. I dyno'd it in france and result was: 369hp and 496Nm. Will install Forge IC and dyno it again. Any updates on the performance of the IC mentioned in this thread? In particular the HPerformance Clubsport and SAR IC's. I have bought the HPerformance IC and it will be installed in acouple of weeks. Did some research before I decided to go for the Hperformance cooler. Looking at it from a pure performance perspective, it utillizes a large core, the entire core is exposed to airflow (removed oem alu bar) is light weight and nice quality manufacturing. Increased the opening in the bumper as well to take advantage of the larger core. Have not measured the IAT yet so can not give a specific number on performance, but for track day use and similiar high boost activity it should allow for long sessions of fun without boost retard. I take it you know it’s not all about size... lol... measure pressure drop also.... across the cooler to ensure your not losing valuable psi.. compared to stock!!! Ed_rx7, I agree that there are more to it than core size and swapping a smaller one to a very large may represent an increased level of pressure drop. All manufacturers mentioned in the thread are serious suppliers with wide background within cooling, and looking at pressure drop tests performed by E-Tuners, STM or others they perform very well in this area. Stock cooler: Peak at 1,75 bar (mid range), reduced down to 1,52 bar at red line. New (Hperformance): Peak at 1,77 bar (mid range), reduced down to 1,58 bar at red line. During the swap the hoses and clamps were changes as well so I can not tell which change that had most impact on pressure gains. Overall it came out with a system that will handle heat and temperatures much better than the stock cooler, and it gained boost pressure over the stock unit without any changes to software. The general cooling capacity seems to be limited by airflow through bumper. Some designs even "hide" the cooler behind the crash bar which really seems strange . 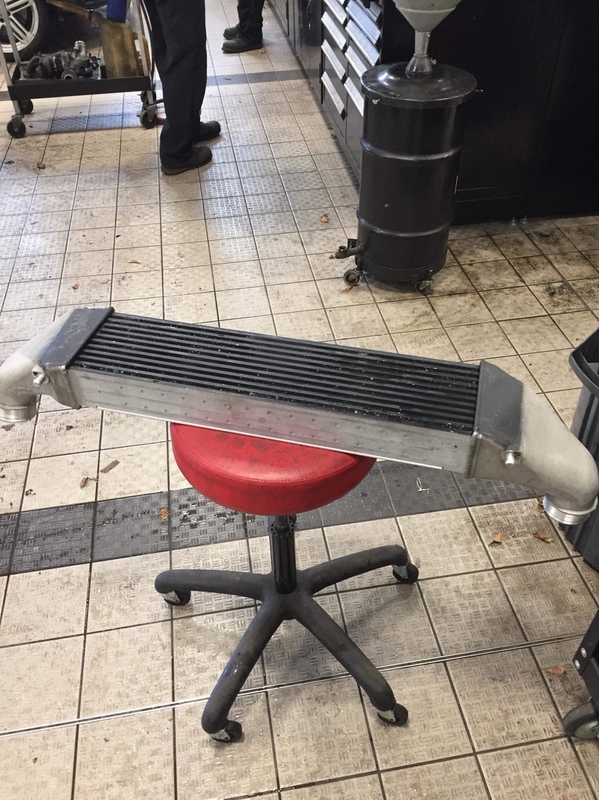 . .
Do you know how thick the HPerformance intercooler is? Is it necessary to remove foam and plastic trim from the bumper? (Like the Forge IC). This Youtube video showing a timelapse install of the HPerformance IC on an RS3 8V may be of some use. Here is a shot of the Iroz motorsports intercooler. It features cast end tanks and a Garrett core. Might be expensive to ship across the pond, but a very nice intercooler. Also the stock IC for comparison. 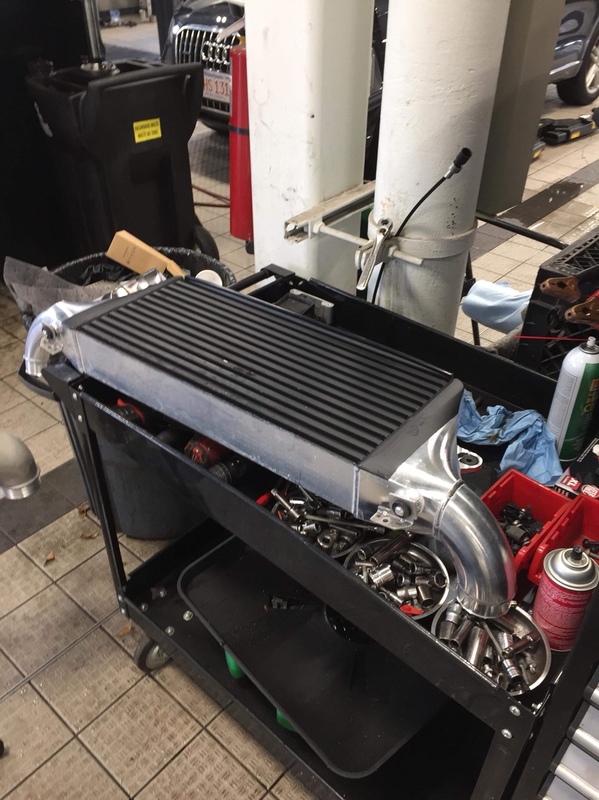 The Iroz intercooler is the best in the market at the moment. Real Garrett core. Not something from a Chinese catalogue. The Wagner core is huge and I wouldn't fit one to my car again. Due to the amount of air that needs to be pressurised across that core there is noticeable lag, this is more noticeable with a bigger turbo. I didn't actually realise how much this affected my car until I went back to stock intercooler with the big turbo in situ. If all goes well this year I'll be building another TTRS to circa 700hp, full Iroz spec. I can't wait!